After looking through ebay and finding pages of seeds that do not exist I thought I would write another post. Hopefully this helps someone not be taken advantage of. I am not a fan of roses and am far from an expert. Even so, it annoys me that so many criminals are selling seeds of roses that do not exist. While you will be sent seeds from these thieves, and they will probably grow, there is a possibility that they will send you rose seeds but they will mostly be white flowered. By the time they flower it will be several years after your seed purchase, far too late to claim money back from paypal. How amazing do blue roses look! Too bad they do not exist. Back when I was studying my first degree I completed a subject called 'Horticultural Science and Plant Biotechnology'. During that my lecturer told me that $10 million had been spent every year over the previous 10 years trying to create a blue rose. The closest we have ever come is a weird looking mauve, she showed me a picture, it was not at all blue in my opinion. Apparently we do not have the technology to do it and it is unlikely that we will gain the technology any time soon. Do NOT buy seed of blue roses. 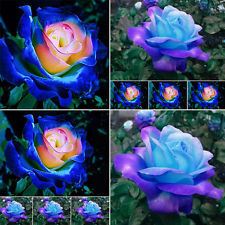 The large photo on the left and the blue rose are the SAME photo!!! 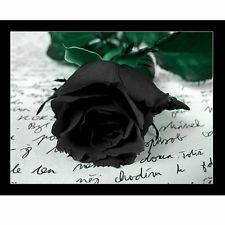 Black Roses look amazing, but unfortunately do NOT exist. 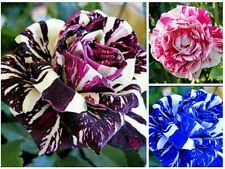 Just like the blue roses there would be a massive market for them if they existed and a lot of money has been put into trying to create them. If they are ever created you will hear about it as it will be a big deal. Do NOT buy seeds for black roses. 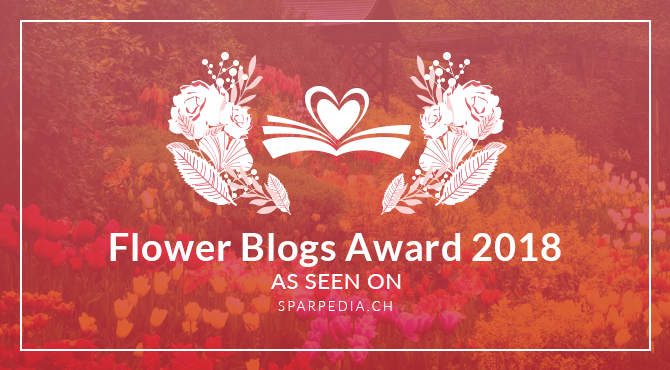 This flower does not exist, they have simply changed the colours on a picture and not even done a very good job. Blue roses do not exist, roses that are blue on one side and green on the other split by a perfectly straight line also do not exist. The sellers even put their name on the photo as they are proud of their deception. Please do NOT buy ANYTHING from these thieves EVER. If they are happy to sell seeds of things that do not exist, what makes you think you will ever get what you paid for from them? If you are one of the criminals responsible for the photograph below feel free to leave a comment and try to justify your deception. Do NOT buy seeds of these. Seriously, why would anyone think this is real? It even looks fake. Strangely they have sold hundreds of dollars of these fake seeds. It is too bad that people do not realise until a year or so afterwards when their rose plant flowers and the flowers are all white. 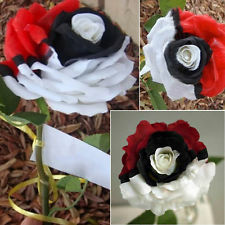 Do NOT buy seeds of pokemon roses. Green roses like in this picture do NOT exist. 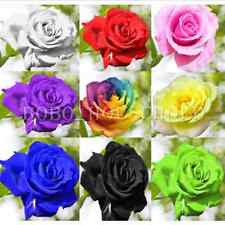 I have seen some roses that are probably considered to be green, but the colour is nothing like in this picture. 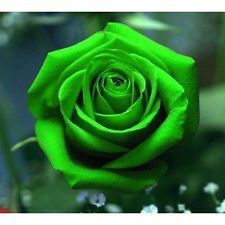 Do NOT buy seeds of green roses. You may have seen flowers like this, you can even buy roses like this from some florists, they cost a small fortune. They can NOT be grown from seed EVER. The reason they cost so much is the amount of work each flower takes. The florists begin with white roses, they split the lower stem and put each part of stem into different colours. The colour goes up the stem into the white petal staining it different colours. It looks great. The florist then cuts off the bottom of the stem so it is neat and sells the flower. 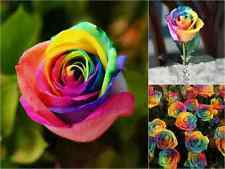 Feel free to buy these multicoloured rose flowers from a florist, or even make them with your kids, but do NOT buy SEEDS of multi-coloured blue roses ever. 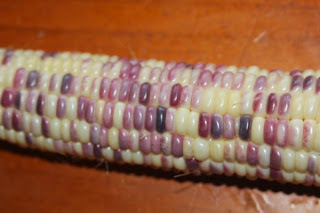 Any time you see pictures like this where they have a mix of different seeds and they include anything that does not exist, do NOT buy from them. If they use the same picture several times and change the colour, do NOT buy anything from them. They are criminals and you should not be deliberately funding criminals. Do NOT buy seeds from someone if anything they list does not exist. Many of these do NOT exist, plus they have used the same picture several times in the one ad and changed the colour! 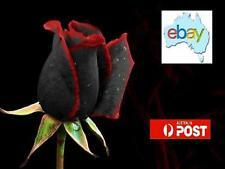 Why does Ebay allow blue roses to be sold? 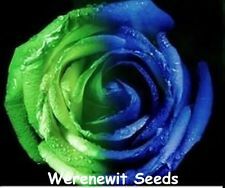 I know some people who claim to report each and every listing of blue rose seeds that they see. They tell me that none of these reported ads has ever been removed. Apparently they report some of these ads several times and still nothing has ever been done. In some ads Ebay has deliberately inserted a broken link so it is impossible to report them. Ebay makes tens of thousands of dollars each year by knowingly allowing and aiding criminals to sell seeds of things that do not exist. "Beware of scams. There are many sellers selling seeds of fake seeds such as blue, black or multicoloured roses (there are no real blue roses, those that are called 'blue' are actually mauve or purple) and black or blue strawberries, these don't actually exist and by the time you have grown the plants and find out they are not as described it is much too late to be able to leave feedback." I understand that ebay gets many new listings each day and can not look at them all. 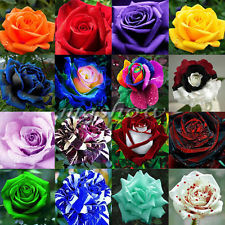 Ebay have systems to prevent all kinds of other (mostly illegal) things being sold, it would not be difficult for them to use the same system to prevent thieves selling blue rose seeds. I had a chat to someone the other day who had bought some seeds from ebay of things that don't exist. Strangely his comment was "it only cost $1, what do I have to lose". What an ignorant view! Do NOT give money to thieves, ever. While you are only losing $1, the thieves are making tens of thousands of dollars each year, honest people are unable to sell rare things, people are less willing to buy seeds of rare plants, rare plants are becoming extinct as fewer people are growing them, and the ebay thieves who sell seeds of things that don't exist have no reason to stop. If you are one of these thieves, or an ebay representative, feel free to leave a comment to try and justify your dishonesty. Thank you for your kind words. After reading your comment I had a look on ebay for blue lillies. After seeing how many thieves are on ebay selling seeds that don't exist I feel very depressed. My opinion of society is slipping more each day. Hopefully these posts help someone not to be taken in by these ebay thieves.